As you will see, the island of Newfoundland is home to the world's largest concentration of Eastern Canada Moose and Woodland Caribou. 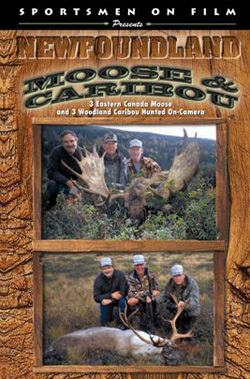 Hunting western Newfoundland with Don and Rod Stowe of Mobile Outfitters and their staff, three hunters. A Sportsmen on Film DVD production. As you will see, the island of Newfoundland is home to the world's largest concentration of Eastern Canada Moose and Woodland Caribou. Hunting western Newfoundland with Don and Rod Stowe of Mobile Outfitters and their staff, three hunters (Johnny Burke, Lad Shunneson, and Ken Wilson) each take excellent specimens of Woodland Caribou in the bogs near Deer Lake. Then Shunneson, Wilson, and Steve McManus helicopter into Mobile Outfitters' remote tent camp for the moose hunt of a lifetime with each looking over numerous bulls before taking high-scoring trophies.